Last weekend, my boyfriend and I drove to the Lake District for no particular reason. We haven't had a proper weekend away together before, so I was really looking forward to it. We were hoping it would be a nice pre-Valentines thing, as the 14th falls on a Wednesday this year so I don't think we'll have much time to do anything special then. We set off on the Saturday, and at some point during the drive Tom realised we were going past Teabay Services. I hadn't been there before; but I'd heard his housemate, Bev, sing it's praises. It's a family run service station featuring locally sourced food, and Bev had described a pie she'd got there in great detail. So obviously I wanted to go. I got some chips and a sandwich which were both delicious, and Tom had a "giant pigs-in-blanket hot dog", which was as ridiculous as it sounds. I should have a got a photograph of that, really, instead of concentrating on getting countryside pictures, as it was a truly extraordinary sight. All photographs taken with a Canon 700D and 30mm f/1.4 Sigma Lens. We stayed in Grange-over-Sands, in a flat owned by a family friend. The views from the windows were stunning. 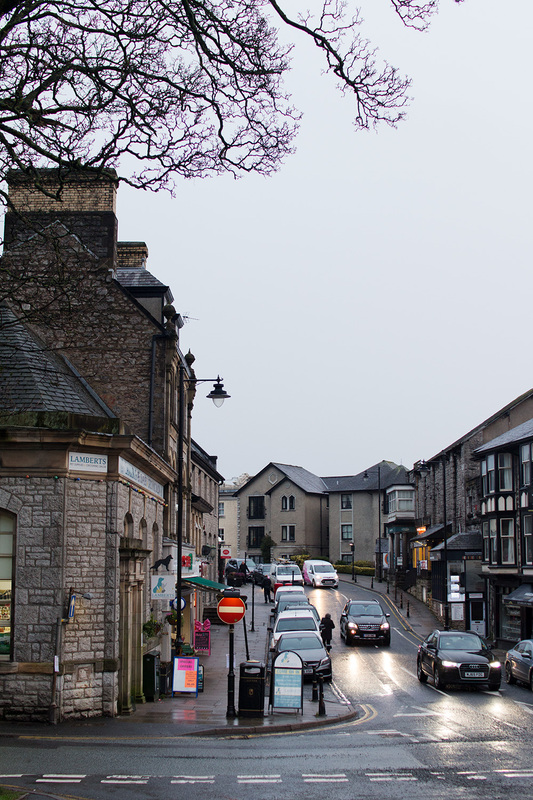 Here in Manchester, when I look out of the window all I see is a road leading to a dual carriageway, but in Grange-over-Sands there were hills and trees and peace and quiet. Us city folk are very easily impressed. When we arrived, it was mid-afternoon, and we both knew there wouldn't be much light left so we strolled down possibly the world's longest hill to get to the local shops and take some pictures. By the time we got there, it was golden hour - well, I thought it was, but it was quite a miserable day so I couldn't be entirely sure. 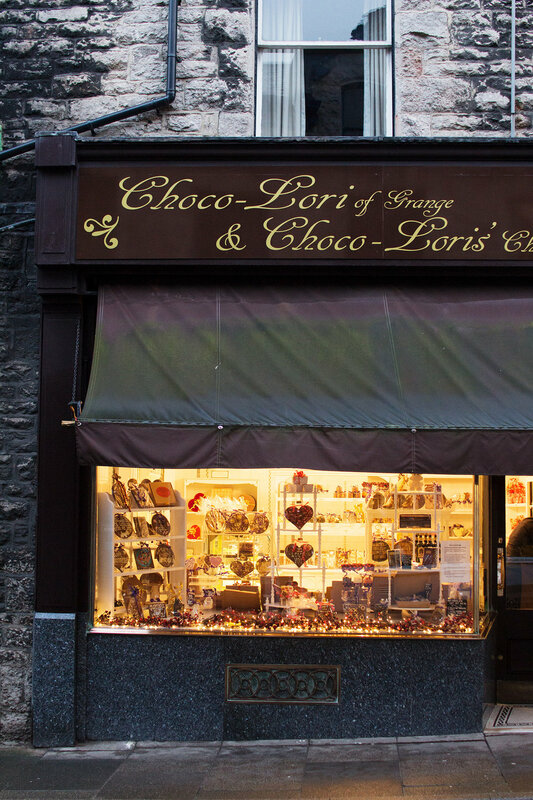 Most of the shops were nice to photograph but we had no intention of going inside - however, when we saw Choco-Lori we both wanted to have a look around. We have a serious sweet tooth, so the homemade chocolates looked very appealing. I could have easily bought most of the shop, but in the end I just picked up a chocolate biscuit bar which was heavenly. The next morning, we set off to Grasmere. I went there last year for a photoshoot, and Tom knew that his grandparents loved it there but had never visited it himself, so as we were so close we thought we'd drive there on Sunday. 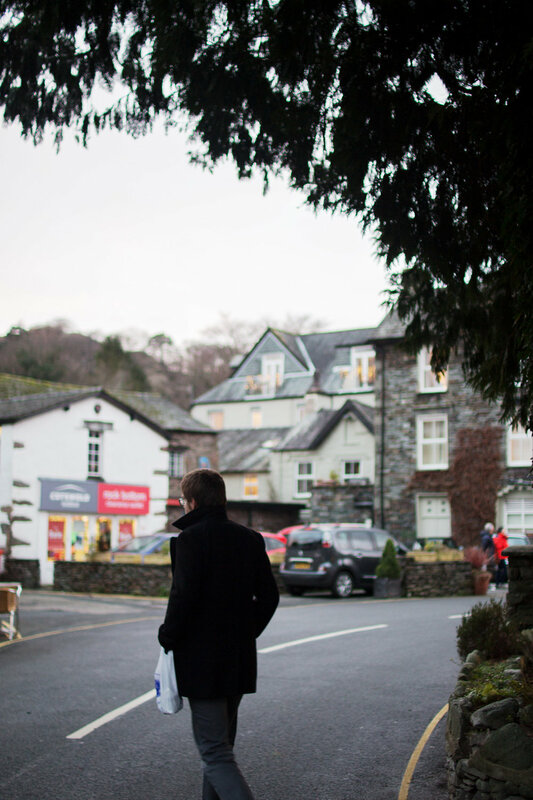 When I went there last year, I went to Grasmere Gingerbread and picked up some gingerbread for Tom, so guess where we went first? Yeah, we like food. A lot. After that, we went to have tea in Baldry's. 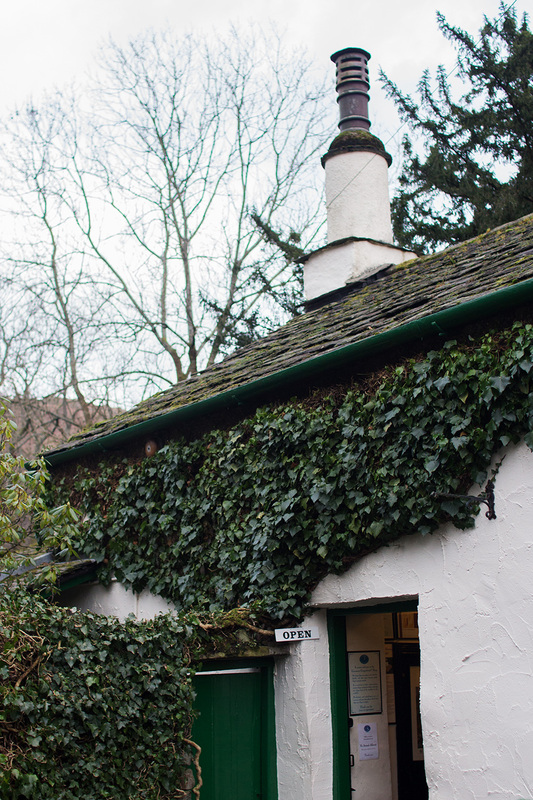 It's only a few minutes away from the gingerbread shop, and it was another place I'd visited last time I was in the Lakes so I already knew it was good there. They're dog-friendly as well, so you almost always get to say hello to a dog when you visit. We drank some Earl Grey and watched as the sun started to set outside. When it was getting darker we knew we'd have to start the two hour drive home. Even though I was sad to leave and say goodbye to what felt like a very short break, the light was absolutely perfect for photographs and I got some really nice pictures on the way back to the car. If you're visiting the Lakes soon, I highly recommend going to Teabay services on your way there and stopping in Baldry's for a brew. And hopefully the weather will be slightly better for you than it was for us! Have you ever been to the Lake District? When was the last time you went away?